Bigger is Better; You Have Never Seen Marvel Artist Sketch Cards Like These! There is a certain thrill that comes from opening Upper Deck Marvel trading cards where you sometimes are lucky enough to find an artist-drawn sketch card. Now Upper Deck is planning to release a super-premium trading card set called Marvel Premier where each pack will have a regular sketch card and a multi-panel sketch card the likes of which entertainment collectors have never seen before. Recently we caught up with Bubby Johanson and Nick Leslie of Upper Deck Entertainment to share a preview of these cards with us. 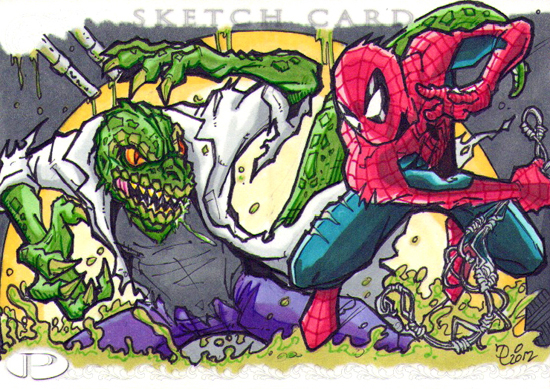 Take a look at some other awesome multi-panel sketch cards from the upcoming release! Jose Jaro’s and Babisu’s are my favorites on this page. I may be picking up a couple of decks! Great looking art. This should be cool. Man Chris Bradberry’s is nice too.